A footnote from history by Stephanie Grace Whitson, author of Daughter of the Regiment. When President Lincoln called for the formation of the United States Sanitary Commission, did he realize what would be required of the men and women charged with collecting and transporting goods to men in the field? Since both the North and the South seemed to think things would be settled quickly, it's safe to say he did not. 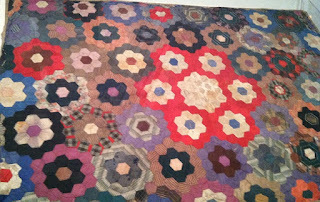 By 1863, women had collected and distributed tens of thousands of quilts and comforters for the soldiers. They had wound miles of bandages and scraped barrels of lint. And still ... the need grew. 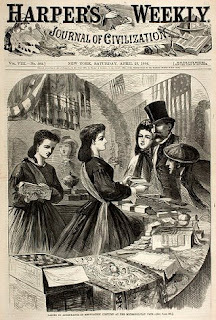 In Chicago, Mary Livermore and Jane Hoge, leaders of the Northwest Branch of the Sanitary Commission, came up with the idea of sponsoring a fair to raise money in support of "the cause." To drum up support for the idea, they sent letters to towns throughout the Midwest and and visited local aid societies, asking women to make or donate items to be sold at the Sanitary Fair. The fall, 1863 event raised $100,000. The outstanding (and perhaps unexpected) success of the first Sanitary Fair spawned more events. 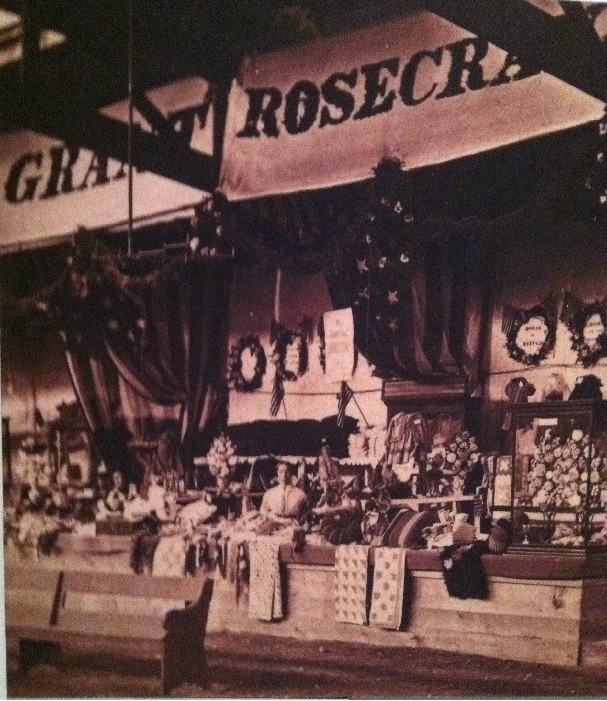 In St. Louis, the Western Sanitary Commission sponsored the 1864 Mississippi Valley Fair and raised more than $550,000. Visitors could browse booths displaying the latest in plows, sewing machines, and all other manner of manufactured goods. The daily newspaper issued for the St. Louis event reported that "Grover and Baker donated three fine machines ... Wheeler and Wilson also three.Our attention was particularly drawn to one of Wilcox and Gibbs ... It is almost entirely noiseless. Singer donated two fine machines of his manufacture. Aiken's knitting machine next claimed our attention. By this a pair of socks can be knit in fifteen minutes!" How many women do you suppose wanted one of those knitting machines? After browsing, fair attendees could have lunch at a cafe (courtesy of the ladies who baked goods and served them), participate in contests, and even go fishing! 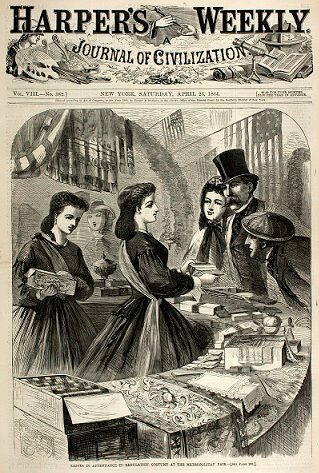 Sanitary fairs drew large crowds, not only because visitors supported the Union army, but also because they brought together a variety of goods for sale in an era when department stores were uncommon. In most towns, stores carried raw materials (bolts of fabric) in lieu of finished products like aprons or ready-to-wear children's clothing. Imagine the fun of spending money on things a woman usually had to make ... and having the excuse that it was "for a good cause." The quilt at left was displayed in the Bed Linen & Quilt Department (pictured above) at the St. Louis event in 1864. A Miss Lizzie Hausler won the quilt, which was valued at $125. The French shelf clock sitting in front of the quilt was donated by the state of New York, which had held it's own very successful Sanitary Far earlier in 1864. The "grandmother's flower garden" quilt at right was also raffled off at the St. Louis Fair. It bears various dignitary's signatures. General Grant's signature appears on the central hexagon. A Nebraska family won the quilt, and it now resides in the collection of the Nebraska State Museum in Lincoln. Fundraising events are common in 2015. Our local Christian school sponsors an "auction" of donated items every year. Raffle quilts are often produced to raise funds in support of a variety of causes. Have you ever made an item to be donated to a fundraiser? If so, you are one of a long line of generous women. Stephanie Grace Whitson's interest in the Civil War inspired her novel Daughter of the Regiment, set in Missouri during the Civil War. This fall, a novella inspired by the service of Illinois women during the war will appear in A Basket Brigade Christmas. To learn more about Stephanie's books, visit www.stephaniewhitson.com. Stephanie loves to chat with her readers. Join the conversation at www.Facebook.com/stephaniegracewhitson-official. Sorry that you've had issues posting, Sharon. Your comment wasn't erased on our end. I'm guessing it must be an internet glitch. But thanks for persevering. I love the flower garden quilt too. I have a similar one that my great-grandmother made. Thanks for persevering, Sharon. 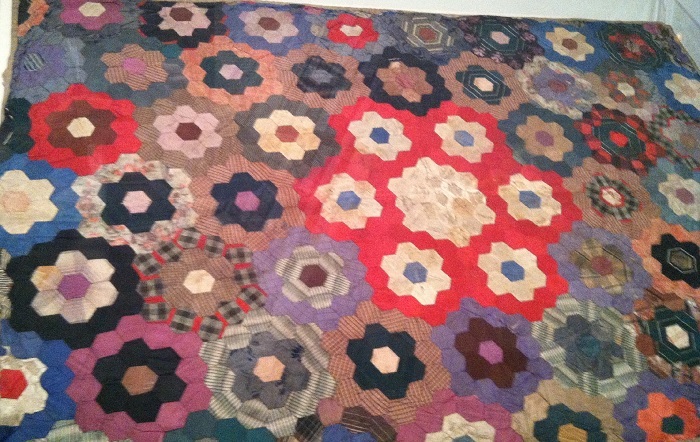 I was thrilled to see the quilt on display at a local exhibit years back and had never forgotten about it. When my research took me into the Civil War theme, I still remembered that quilt with General Grants (fading) signature in the center. 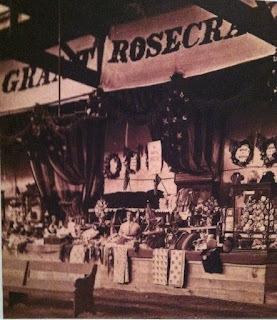 Grants daughter, Nellie was "The Old Woman in the Shoe" for the fair, as well. There's an adorable photo of her in spectacles and a colonial-era frumpy-looking hat. Those Sanitary Fairs sound like a lot of fun. It brought people together for a good and practical cause. I wish I could have shopped for quilts back then. I've always wished I could see ... really see ... the quilts on display in that archival photograph. And I always wish they could talk to me and tell me their stories. Interesting post. Seems logical they'd have fundraisers for various causes. Would love to see some of those quilts. Houston has the International Quilt Festival every fall, and there some amazing quilts on display there. Wish I had an old quilt handed down. My grandmother crocheted rather than quilted. Women just do that, don't they, Martha. They "step up" and find ways to make a difference for the causes they care about. I've been the Quilt Festival many times, but it was years ago when I was a quilt pattern designer. My best friend and I were vendors at the Quilt Festival. I'd love to go back as "just" a quilt lover. And I love crocheted work as well ... the lace edges on vintage linens fascinate me, but I've never tried to do it. I love crochet, too. I have a set of pillowcases an aunt embroidered and then crocheted the edging. After all these years of marriage, I finally decided to start using them, and they've held up very well. Also have a bedspread, afghans, table doilies and tops. I even framed some of the older ones and have them arranged above the bed in our guest room. The bedspread has a "popcorn" design and always left an imprint on my face when I took naps as a little girl. Oh, my, you've brought back a bunch of memories for me. Thanks.